Royal Sutton AC will be running the popular Startrack athletics course again this summer holiday. The course is aimed at 8-14 year olds and is designed to provide a fun introduction to athletics. Well done to Steve Marklew and Mark Bridges who spent last weekend running the length of Hadrian’s Wall. Steve completed the 70 mile run in just over 15 hours, whilst Mark completed the two day team challenge in just over 11 hours. Suddenly that track session doesn’t seem so hard after all! 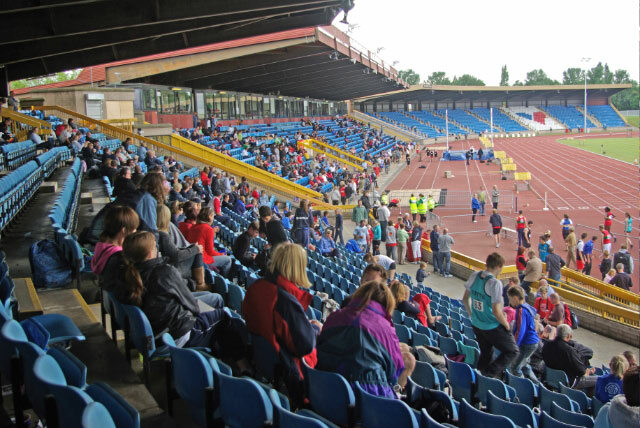 We had a number of athletes competing at the Midland T&F Championships at Alexander Stadium over the week-end. Despite tough weather conditions, there was a high calibre of performances from all athletes. Nicholas Pryce was 4th in the 200m Final, equalling his club record of 21’8 which he also did in his heat ! He also finished 6th in the 100m Final after running 10’91 in the heats. His mum Janice took 4th place in the triple jump. Charmaine Riley-Nelson was 6th in the 200m Final . Fred Tremblay managed to break 2mins in his 800 heat, before taking 7th place in the Final. Congratulations to Ollie Haradence and Andrea Deathridge who both won trophies at the Arden 9 mile road race. Ollie was the race winner, whilst Andrea was third home in the women’s race. Connor Notley set a new club record in the discus whilst competing for the West Midlands in the Mason Trophy on Saturday. His throw of 34.07m beat the previous record set by Ronald Comrie in 1997. Elemena Saunders was also competing and she recorded a 2nd place finish in the 800m with a time of 2.18. The results from the event are available here. We also had athletes competing in a Heart of England fixture at Coventry. The results should appear on the Heart of England website in due course. A link is available here. Congratulations to Katie Ingle who had another fantastic victory at the weekend to win the 3k steeplechase at the English Athletics U20 Championships and Euro Trials. She ran a time of 10.29. Nicholas Pryce also competed at the event and got to run alongside Adam Gemili in the heats of the 100m. He reached the semi final of the 100m running 10.81 and 10.90 in his two races and also ran 22.02 in the 200m. Videos of the action are available on the Athleticos website here.